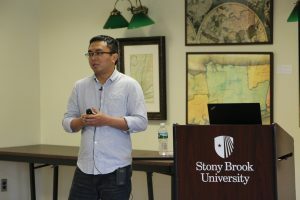 On May 1, Dr. Xiaojun Bi, from the Department of Computer Science, presented his innovative research on computational interaction for designing software user interfaces and interaction technology. From historical use of typewriters to modern day use of virtual keyboards, humans interact with different text input devices. As text entry is a crucial part of text-based communication on mobile and wearable devices nowadays, Dr. Bi studies keyboard designs and gesture typing to enhance the interaction between humans and information technology. 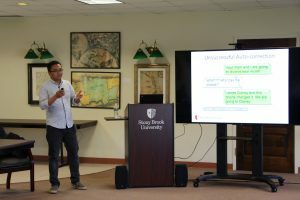 He discussed the advantages and disadvantages of various touch screen interface designs such as the standard Qwerty keyboard design, optimized of English layout, and Quasi-Qwerty layout. 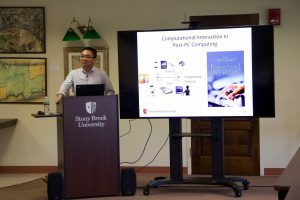 To solve the challenges of interface design problems, Dr. Bi uses algorithms and mathematical models to enhance post PC era touch screen interaction. He is experimenting with keyboardless text entry on touch screen devices that will transcend the touch screen technology to a whole new level of human experience. 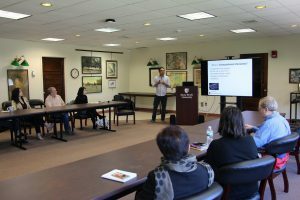 The intriguing lecture generated a rich discussion on the interaction between human and touch screen technology.